Show off your work and present a beautiful photographs that you took! Fullsize photos are like a magnet: it means they attract the attention of your customers immediately. So why not to show them right on the main page in the Background Slider? 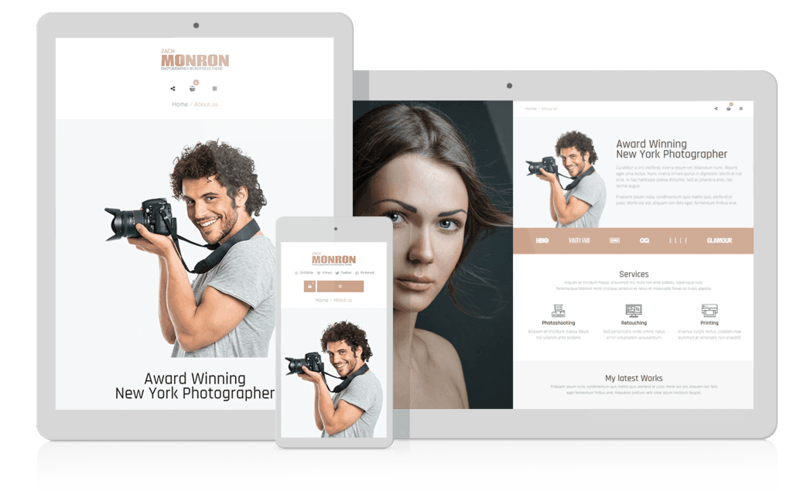 Photographer WordPress Theme brings the most important thing for photographers and designers. The perfect place to present your own photos, photobook and portfolio. 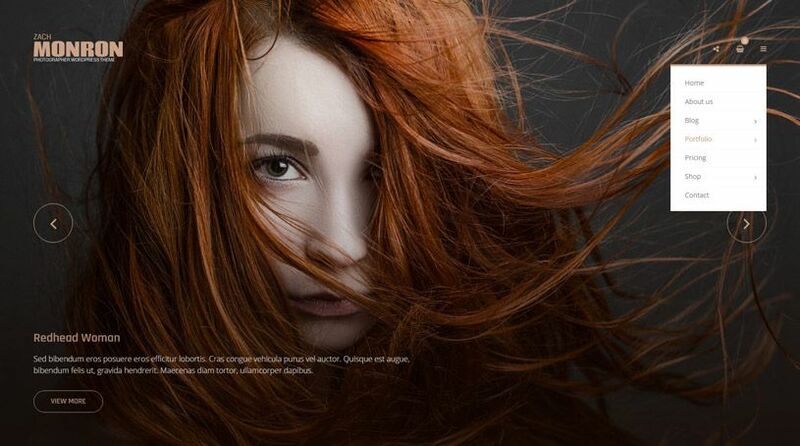 This theme is perfect to exhibit photographic art because it eliminates all other disturbing elements on the page. Choose minimalism. Allow customers to succumb to the charms of your photos at the first glimpse! Background Slider enables your pictures to stand out. How? You can choose the best and latest pictures and add them to the background. If you add more photos, Background Slider works as a slider. 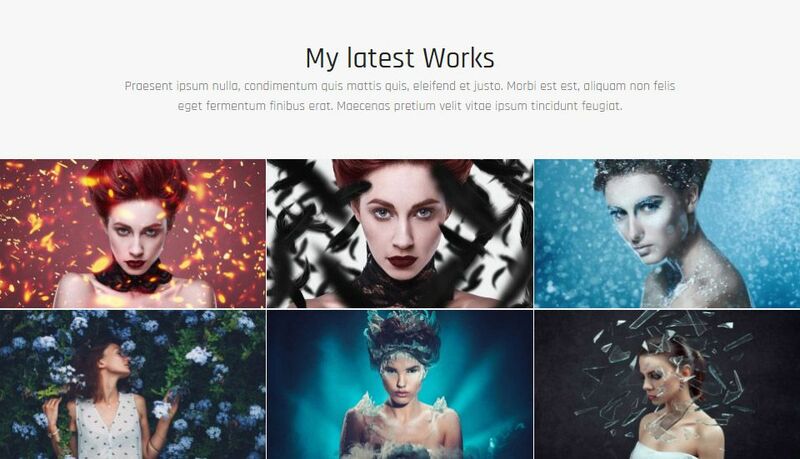 Your photos will be displayed on the whole site, and visitors will be able to switch between them with arrows. It is possible to upload only one, single photo within the Background Slider – then the image expands to fill the width and height, and therefore can be used as background for the selected sub-page (eg. About us). You can only see the entire width of the image when all elements on a site are switched off. Minimalist Header displays only what is absolutely necessary for orientation on the page. You can have a breadcrumbs navigation and icons for social networking, icon for a shopping basket and Burger Menu in which you can hide other items. User-friendly contact form, easy set-up & unlimited inputs. through which you can be contacted by your customers. It can be used also as pre-order form. Area for WordPress widgets and other additional information. Add search box, blog or anything else you need in Sidebar. It is also very easy to hide Sidebar anytime. 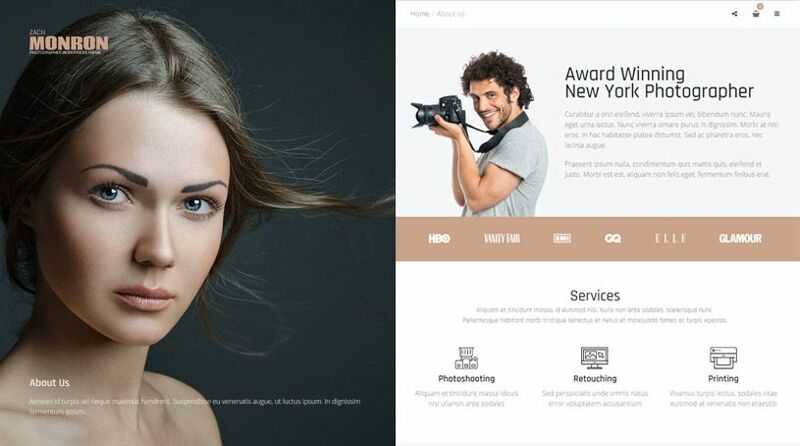 Customize your website Photographer menu to your own purpose. Thanks to Burger Menu only the most important items and icons remain on – everything else will be hidden in a rolled-out menu. Nice theme, but, I want to post 360° Photographies, the theme is optimized for this? we are sorry, no special functionality integrated with a theme, perhaps some a 3rd party plugin might be useful to find a solution on your demand. I activate Multilanguage, and inserted in Top Menu but it doesnt show up. Good day! 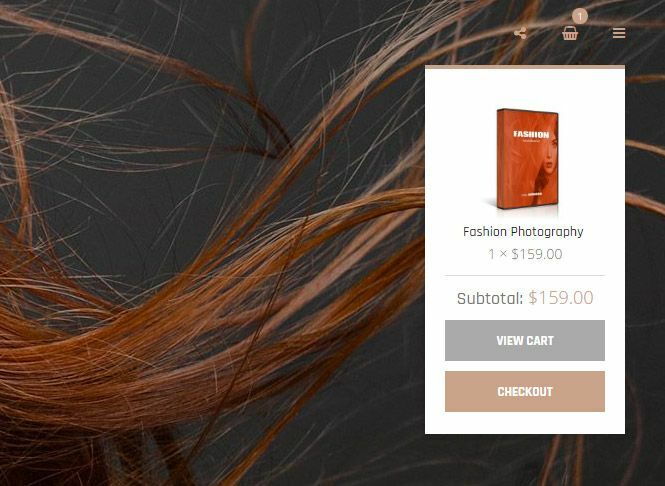 Bought the Photographer theme and does not appear in Services menu. What to do? thanks for asking. Does the issue still persists, as i have noticed that you were able to download product a few hours later? Or, are you asking about the Services custom post type? 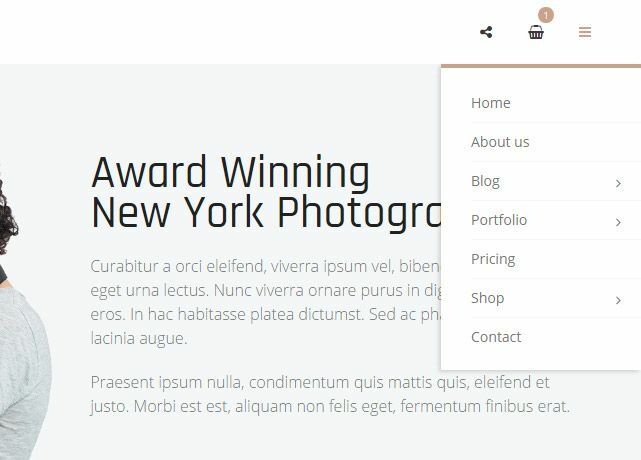 Well in such a case there are some differences between the themes as not each theme uses the same custom post type and the element in page builder. 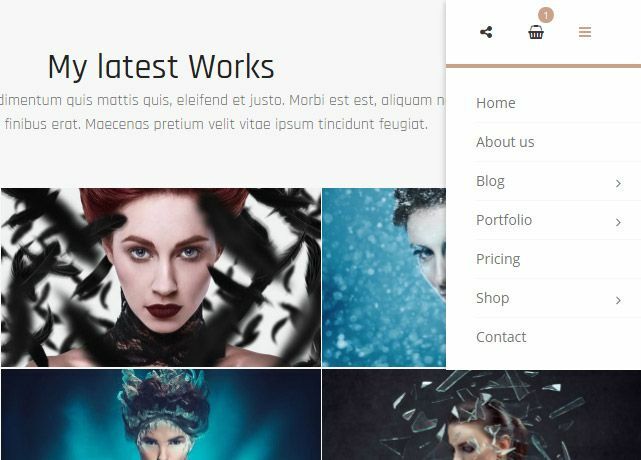 Should you be interesting to extend theme functionality it requires customization and i would advise you to contact an experienced wordpress developer/designer who will help you to create unique web site. Hello, I’m having some dificulty changing the background photo of my home page. I accessed all the menus in the admin pianel but did not find it. Could you help me? thanks for interesting in our products. We are sorry, we have no other a special offer on Full Membership package for the moment. Thanks for understanding. 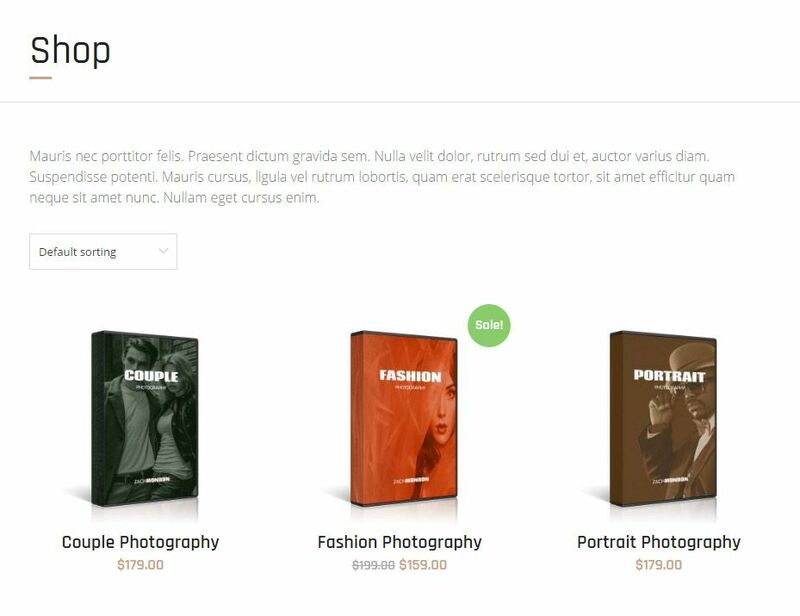 Hi, my products are very beautiful and I want to know what is the difference between the free version and the paid version of the theme?